We’ve all experienced it before – the wardrobe malfunction. You’re rushed. You’re late for work and at some point during the day some helpful soul points out that your shirt tag is hanging out. Even worse? You’ve tucked your skirt into your tights. Is the embarrassment really worth not double checking in the mirror before you leave? Dresser mirrors have been around for as long as there’s been bedroom furniture. 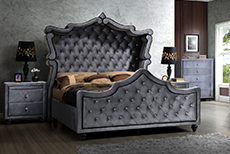 They are a standard part of a traditional bedroom set and come in coordinating styles and sizes. Whatever the reason, if you don’t have a mirror above dresser it’s time you invested in one. There’s only so many humiliating wardrobe moments a person can have before they just start to look silly. Before you start your search for the ultimate mirror over dresser find, you need to do a little preparation. Your first concern is the size of your existing dresser. Designated dresser mirrors come in various widths to accommodate dresser sizes. Be sure that choose either a double size or single depending on your needs. The right mirror furniture dresser for you also depends on the style of your overall bedroom. Lovers of a uniform look should co-ordinate with their existing furniture as much as possible. Mirrors can also work as an accent piece. Try choosing a unique style that brings out other elements in the bedroom. For example, you might have a favourite décor item with a distinctive shape or pattern. Bringing a similar style mirror into the room will serve to bring attention to your pet piece rather than detract from it. This is good attention we’re talking about here – not the kind that comes from unknowingly putting your shirt on inside out! Your Satisfaction – Our Prettiest Reflection! There must be some readers who are only now realizing that they don’t even have a proper dresser. Not to fear. At 1StopBedrooms we not only have a variety of mirror dressers for sale but in such a wide range of styles that you’re sure to find one that suits you. Looking for cheap mirror dresser finds? Elaborate conversation pieces? Single mirrors or entire units? Our low prices are a reflection of our excellent relationships with direct suppliers and the coupons and sales we offer are a reflection of our commitment to our customers. We don’t want you to be embarrassed again any more than you do.